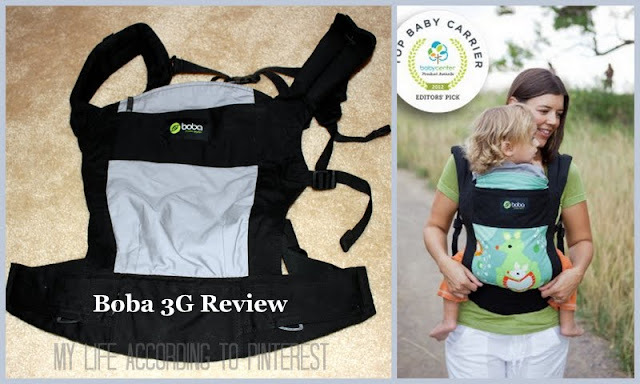 I was so excited to get to try out and review the Boba Carrier 3G! I had tried some other carriers and wraps with my little guy, but I just didn't love any of them. The carriers hurt my back (which was already hurting most of the time from having to carry around a baby and bad posture!) and I just never felt like my wrap was quite secure enough- especially when babywearing for extended periods of time. I really wanted to try some other carriers, but their expensive price points kind of deterred me, so when Boba generously agreed to let me review the Boba 3G in glacier I was beyond happy! The Boba Carrier 3G includes more than a dozen features making this carrier super awesome. First of all, the carrier was voted the 2012 Top Baby Carrier by Baby Center, so you know people love it. 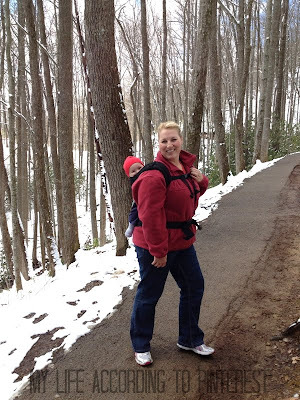 It's a Soft Structured Carrier that is intended for babies and children between 7-45lbs. It's perfect for babies and toddlers alike, the Boba Carrier can be converted to a newborn carrier without an infant insert or any additional items like some of the other brands (so no additional costs) and it can be used well into toddlerhood. Plus, Boba has front and back carrier options for you and your baby. The ergonomic design, patent-pending foot straps, and multiple adjustments make this carrier the perfect fit for anyone to use. The new 3G design is made to fit parents of all shapes and sizes without purchasing an extension belt or accessory. It is designed to comfortably fit heights from 5'0" to 6' 3" and a waistband range from 25" (I wish!) to 58". I'm no skinny mini and I had no problems what so ever using this carrier! Plus, added bonus- I didn't feel fat wearing it either which is a really nice feeling. ;) You can also find instruction on how to properly use all of Boba's babywearing gear by visiting Boba's instructional page. All of the straps on the Boba 3G are fully adjustable, and elastic bands are provided so you can comfortably tuck the straps away once you have the carrier adjusted for you and your child. The buckles on the Boba are military grade so you know they are STRONG! It was easy to adjust to fit whether wearing Baby Boy on the front or back. This carrier also offers a removable sleeping hood that adjusts in length to fit growing babies. When you're not using the sleeping hood, you can use the zipper pouch to store it, or you can store some things for yourself (phone, money, etc.). I use my Boba 3G around the house whenever Baby Boy is fussy and wants to be carried. He loves being in there. When I use it on a daily basis I usually carry Baby Boy in the front carrier position. I've also used my Boba while hiking in the Smoky Mountains. It was awesome! We did a hike to Laurel Falls while we were in Tennessee this spring. It's about a 1.5 mile hike mostly uphill to the falls and then 1.5 miles mostly downhill on the way back. Baby Boy rode the whole hike on my back. He was great! (It was unexpectedly cold while we were there, so he's super bundled up. Yes, he's wearing socks for mittens and a hat that's a little too small. We live in Florida and were not prepared for snow when the normal temps were supposed to be in the 50's/60's!) He didn't cry or fuss once on the way up. We took him out for some pictures at the falls, and then he fell asleep riding on my back on the way back down. I loved this as well. It was very comfortable and didn't hurt my back at all. The Boba is by far the best carrier I have tried! It was the perfect thing to have for this hike! Follow & Connect: You can like Boba on Facebook or follow Boba on Twitter. Buy It: You can buy the Boba 3G for $125.00 from their website or find a store near you. Looks like an awesome carrier!! He looks so snug in there. I love my Boba 3G so does the hubby! I don't have the 3g, but i do have a BobaAir and it is great in summer!